Hello! I took a visit to the library yesterday and ended up signing out five novels along with my hold that came in (Life as we Knew It). 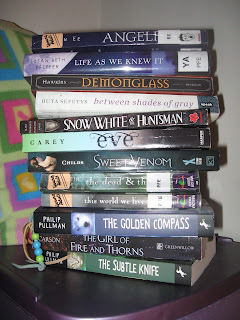 I also had three other books signed out from before, and the book I'm reading (Angelfall). And then I signed out two more books today. The stack is mostly organized by priority, top being the books I'll read first. 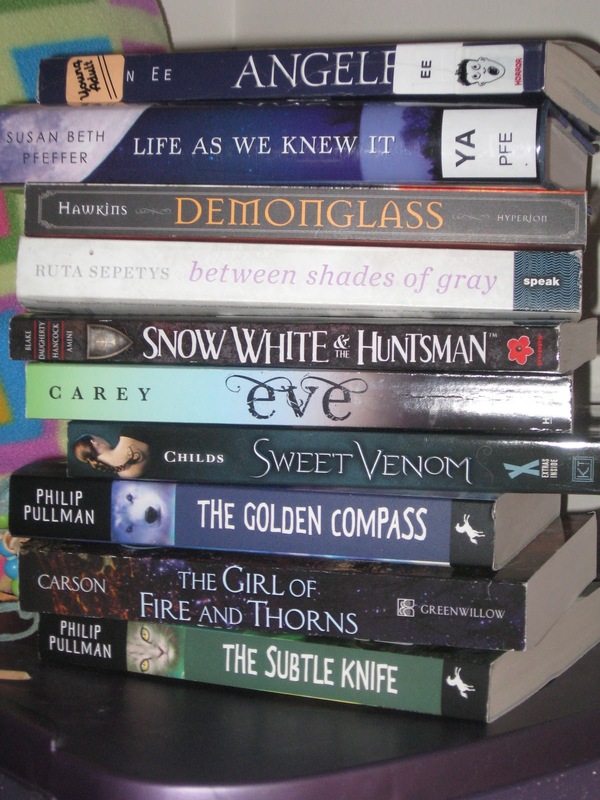 I most likely will not be finishing up my December haul, as I stared the Golden Compass and realized I wasn't in the mood to read it because the beginning was too slow. Also, I do not usually read books that were originally movies, but Snow White and the Huntsman is short and sounds interesting. 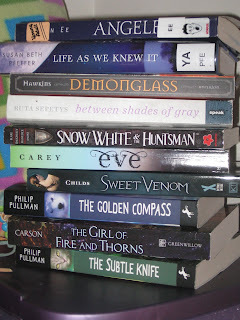 I have pretty much ditched my December haul though I may read The Golden Compass this month. I may not read the whole Last Survivors trilogy (I can't use that term anymore! Just found out a fourth book is coming out in September!) if I don't like the first one, and I may not read the Host since it's so big! I don't know if I want to read a huge book right now. You think that's a lot... I had 29 books. 29!!!!!!!!!!!! Haha, yep, I'm pretty crazy! And I'm picking up at least 3 more books tonight. By the end of tomorrow I'll probably have 20 or so. At first they didn't have Angelfall anywhere, but then the library got it! Haha thanks Kalindee! My new stack from yesterday has 19. I really can't help myself, but most are paperbacks so I can have them out for up to three months!! !